San Miguel Premium Lager | San Miguel Brewery Inc. In true adjunct fashion, it's very clear and light gold in color. It doesn't stand out from the crowd much thus far, but the head gives it a nice bump. It's foamy white and is easily two fingers tall. No to mention, it took quite a while to dissipate. Lacing was on the lighter side. Easily above average. As I suspected, it drops off here. But, not as dramatically as I expected. Grains and grassy notes are prominent. There's quite a bit of malt sweetness that doesn't smell bad at all. It has a very faint vegetal smell, but it's not offensive. It's not good either, but it's not nearly as bad as some I've encountered. Some light hops are noted. It's weak and lacks diversity. Ultimately, it's average, but exceeds my expectations. The flavor profile is on par with the nose. It has a decent sweet, malty flavor. Grains, grass, and earthy flavors linger throughout. There's a light hop flavor that adds a little buzziness and drys it out a decent bit. It has a slight corn-like flavor, but it's not prominent by any means. That bodes well for this beer. It finishes sweet and a little dry. There's not a lot of flavor here, but it's really not bad. Average describes the flavor pretty well. The feel is probably its worst feature. It's light, watered down, and isn't remotely smooth. Carbonation's buzzy and crisp. Needs some work here. Drinkability is average at best. This bottle's disappearing quickly, but I can't say I'm enjoying. There's worse out there, but I won't be having any another. Honestly, this beer surprised me a little. I believe it's my first beer from the Phillipines and I was expecting it to be a disaster. That's not the case. It's not good by any means, but it's not bad either. There's far worse adjuncts. No doubt about that. Still, I can't exactly recommend buying any. It's not quite "good" beer. 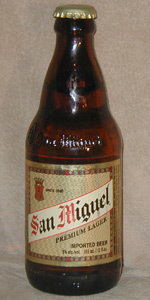 San Miguel Premium Lager from San Miguel Brewery Inc.